Are you located in Montana, North Dakota or Wyoming, and do you have questions or need help with US Citizenship? Keep reading then and you’ll find answers in our US citizenship guide. Alternatively, if you just need help now, you can click here. Obviously, people born in the United States obtain citizenship as a birthright. But, what about people who are not born in the United States, is there a way for them to obtain citizenship too? If being born in the US was the only way to become a citizen, immigration lawyers would have nothing to do. The question would be easy, were you born in the United States? If you were not you are not a citizen. However, it isn’t as straightforward as this because the United States does provide different methods of becoming a citizen. This paragraph outlines the four main ways people not born in the US become citizens. For more details about the various routes, you can click on the link to the route that most interests you. Part one covers derivative citizenship, or obtaining citizenship from your parents even though you are not born here in the United States. Part two covers citizenship for adopted children. Since law changed in 2001, the process for adopted children to become citizens is a lot simpler. Part three covers naturalization, the process of becoming a citizen if you are not born here and cannot claim citizenship through your parents. This process of naturalization is what most lawful permanent residents go through to become United States citizens. Lastly, part four covers citizenship through military service. This process is perhaps a special case of naturalization. If you are a member of the military certain naturalization requirements are waived and it is possible under certain circumstances to become a U.S. citizen without first becoming a lawful permanent resident. Regardless of your path to citizenship, or your US citizenship question, Immigration Law of Montana, P.C. can help you. 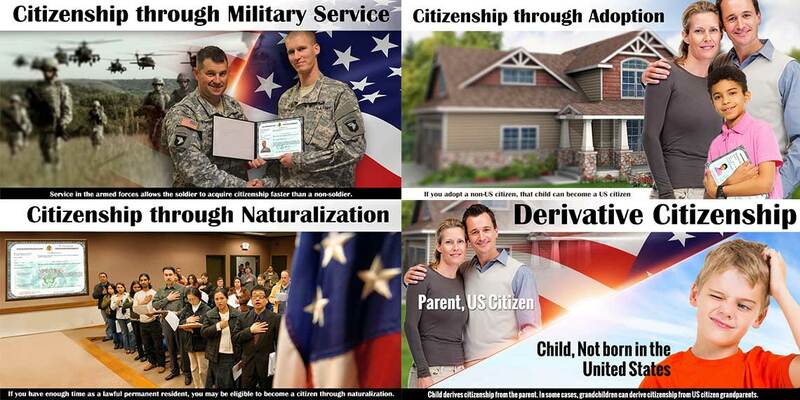 If you would like to discuss any help you need with US citizenship, please contact us.